ANSI/ALI ALOIM (current edition) , the American National Standard outlining the safety requirements for proper vehicle lift operation, inspection and maintenance, requires that a “qualified lift inspector” inspect every lift at least annually. For years, lift owners were left to find and evaluate “qualified lift inspectors” on their own with no uniform standards or guidance. With the introduction of the ALI Lift Inspector Certification Program, lift owners now have a trusted third-party source to find local lift inspectors who have been tested and found qualified to inspect any lift. Please review this list of frequently asked questions for more information. Can a noncertified lift be inspected? YES! All lifts should be inspected regardless of certification status. A lift is not required to be certified to pass an inspection. Can you briefly explain what ALI’s Lift Inspector Certification Program is? The ALI Lift Inspector Certification Program was created to provide third-party qualification of vehicle lift inspectors and to certify those who demonstrate that they are capable of properly inspecting any type of lift from any manufacturer in accordance with the ANSI standard governing vehicle lift inspection and in support of OSHA’s General Duty Clause, as well as provincial requirements in Canada. The program is open to anyone with a minimum of 12 months of related experience. Participants receive extensive technical information and documentation of the proper methods to evaluate an automotive lift. To obtain certification, participants must attend a six-hour orientation workshop, pass a pre-course and final course exam, and properly complete 12 practical lift inspections on a range of vehicle lifts. The ALI program is the first in North America to independently test and certify individuals as qualified to inspect any vehicle lift and determine if it is suitable for continued use. Why did ALI develop the Lift Inspector Certification Program? The Automotive Lift Institute’s mission is to promote the safe use of vehicle lifts in North America and elsewhere. The Lift Inspector Certification Program is an extension of the other safety-related undertakings of ALI, such as our standards-developing efforts, our third-party product certification program and the development of our generic industry safety and training materials. The self-study lift inspector certification program is comprised of a series of manuals, some for learning, some for technical reference, and some for the administrative requirements. There are written tests and practical experience requirements involved. In September 2015, ALI attained program accreditation from the American National Standards Institute (ANSI), the same organization that has accredited ALI as a standards developer and as a third party product certification body. How do you anticipate the program affecting the overall integrity of the lift manufacturing process? We have already seen the positive results of our independent third party product certification program wherein some Authorities Having Jurisdiction (AHJ’s) are hanging red tags on lifts not bearing the ALI Gold Automotive Lift Certification Label. We expect that in a short time we will see a similar effect created by the Lift Inspector Certification Program. What do building codes require for automotive lifts? The International Building Code (IBC) at Chapter 30, Section 3001.2 “Referenced Standards” cites ALI ALCTV, which is the Standard for Automotive Lifts – Safety Requirements for Construction, Testing and Validation. The ALCTV Standard requires among other things, that automotive lifts be electrically listed. This listing encompasses the entire automotive lift as a complete product, not just the individual electrical components. Authorities Having Jurisdiction (AHJ) that require compliance with the International Building Code will likely require lift owners to demonstrate Third Party Compliance (Listing and Labeling) of automotive lifts installed as new construction, relocated products, or as the replacement for worn equipment. Does OSHA require automotive lift inspection? OSHA has no regulations that speak directly to the subject of vehicle lifts. However, the National Technology Transfer and Advancement Act, signed into law March 7, 1996, allows for government organizations including OSHA to apply nationally recognized standards such as ANSI/ALI ALOIM (current edition) to satisfy its safety mission by suggesting the use of such requirements to abate infractions cited under the existing OSHA regulations. Does OSHA have electrical requirements for automotive lifts? OSHA requires that all electrically operated products (vehicle lifts included) be determined safe by an OSHA Accredited Nationally Recognized Testing Laboratory (NRTL). Automotive Lifts Certified to ANSI/UL 201 – Standard for Safety for Garage Equipment comply with this requirement as this standard sets forth the electrical requirements for garage equipment and further requires ANSI/ALI ALCTV certification for the mechanical and structural elements of automotive lifts. While OSHA does not enforce standards from other standards-setting bodies or non-governmental organizations unless incorporated by reference into an OSHA Standard or adopted as an OSHA Standard, national consensus standards and manufacturers recommendations may be used as evidence of hazard recognition and the availability of feasible means of abatement in cases where an employer is cited for a violation of the General Duty Clause. OSHA has no regulations that speak directly to the subject of automotive lifts however, OSHA does require under Subpart S, Electrical; Section 1910.303(a) that equipment shall be acceptable only if approved as defined in Section 1910.399. Section1910.399 defines “Approved” by OSHA as being acceptable to OSHA. This Section further defines being acceptable to OSHA as being accepted, certified, listed, labeled or otherwise determined to be safe by a Nationally Recognized Testing Laboratory (NRTL). Independent laboratories such as those supporting the ALI Lift Certification Program are granted NRTL accreditation status only by OSHA. Are you aware of any statistics of shop injuries related to lifts? We are not aware of any statistical data on accidents involving automotive lifts in the United States. The statistics that do exist relating to automotive service facilities include a myriad of unrelated injuries from the many different types of equipment and activities found in such facilities. Can I inspect a noncertified lift? YES! Inspect all lifts regardless of certification status. A lift is not required to be certified to pass an inspection. What are the steps to inspector certification? The program participant designates a “responsible employee” to manage the company’s participation in the certification program. The program participant submits an application and pays the required fees. The responsible employee fills out and submits the required forms for review and approval by ALI. The participant establishes quality assurance procedures, if they do not already exist. The responsible employee attends an orientation workshop which details the administrative aspects of the program and establishes the understanding between the company and ALI. The candidate inspector reviews the provided Candidate Handbook learning materials either on his/her own or through one of the lift manufacturers or other organizations offering classroom learning. The candidate inspector takes the Pre-Course Examination. After passing the Pre-Course Examination, the candidate inspector takes the Course Examination. On completing the Course Examination, the candidate inspector performs 12 practical experience inspections of specified automotive and heavy-duty lifts using the approved participant inspection forms. The candidate inspector submits the paperwork associated with the 12 inspections to ALI. ALI returns the inspection paperwork to the candidate to correct discrepancies. The participant’s quality system must successfully pass an Initial Compliance Audit (ICA). Quality audits are conducted as required by the Program Participation Manual. What are the duties of the designated Responsible Employee? The “responsible employee” will interact with ALI on issues of ongoing quality and thoroughness of the applications and required documents. This person will be required to gather or develop the necessary forms used in the inspection process. This person should have enough operational oversight within the organization to work with management and inspectors to develop and implement any operational changes required to comply with all certification program requirements. This individual is most likely the person that will be responsible for operating the day-to-day aspects of the participant’s lift inspection business. What are the duties of the candidate lift inspector? The candidate lift inspector will be required to document basic experience and pass both the Pre-Course and the Course Examination, as well as the 12 practical inspections. Candidates should be familiar with the Participant and Inspector Code of Ethics and should become proficient with their employer’s inspection forms and changes to their services that may be required to comply with the Institute’s Inspector Certification Program. How can I prepare for the examinations? Self-study, work with a mentor or ALI factory designated trainer, or participate in workshops offered by a responsible lift manufacturer. What if I don’t pass the Pre-Course or Course Examination? There will be opportunities to re-take the examinations under certain circumstances and within certain time limits. I am a sole proprietor; can I become a certified lift inspector? Yes, if you are the sole proprietor of a legally organized entity In North America and meet the technical and administrative requirements of the program. Are there requirements for my company to carry liability insurance? Yes. The requirements are defined in the Inspector Certification Program Manual (ICPM). I am an elevator inspector; can I become a certified lift inspector? Yes, if you are a direct employee of a legally organized entity in North America and meet the technical and administrative requirements of the program. I am an aerial platform service technician, can I become a certified lift inspector? I have a lift sales and distribution company, can I become a certified lift inspector? Can I participate in the program if my company has no relationship with any of the members of ALI? If I become a certified lift inspector, will I be qualified to inspect all automotive lifts regardless of manufacturer, age, configuration, location or condition? If my company becomes a Participant, will we qualify for membership in ALI? Yes, once a participant has at least one certified inspector on staff, the participant is eligible to apply for Associate Membership . ALI Associate Members may elect one Participant Delegate from the Associate Member Class to represent the class on the ALI Board of Directors. Other benefits of Membership are available for review at the time of application. If my company becomes a Participant, will we qualify to vote as members of ALI? ALI Associate members may elect one Participant from the associate member class to represent the associate members on the ALI Board of Directors. What documents will ALI accept as proof of legal entity? Proof of legal entity requirements can be satisfied by providing a confirmation letter from the secretary of state for the state or commonwealth in which your business is organized. This document identifies your business as a valid organization. For the purpose of this program, IRS filings and copies of tax returns are not acceptable documents to establish proof of legal entity. Do all inspectors have to be certified through the program? No. Participation is voluntary, however, ALI Certified Lift Inspectors have a significant competitive advantage. ALI Certified Lift Inspectors are listed in an online directory that makes it easy for customers to find a local inspector. They also have exclusive access to purchase serialized inspection labels to affix to customers’ lifts after annual inspections. They receive complimentary copies of ANSI lift standards and other lift safety materials as updates are published. And Participants that choose to become ALI Associate Members are eligible to receive up to 40 percent off list price of most available safety materials. I am having my lift inspected – What about generic ANSI and OSHA inspection claims? Claims stating “ANSI certified” are invalid. Claims that state “Meets all ANSI standards” are meaningless. The American National Standards Institute (ANSI) oversees the creation, promulgation and use of thousands of norms and guidelines that directly impact businesses in nearly every sector. ANSI does not perform product compliance evaluations, inspection services for hire, and does not provide product certification. In order to comply with the requirements of ANSI/ALI ALCTV, third-party testing and certification is required. ALI’s automotive lift certification program meets this requirement. Claims stating “OSHA certified” are invalid. Claims that state “Meets all OSHA requirements” are meaningless. There are no OSHA requirements at the Federal level specifically citing a provision for automotive lifts. However, OSHA references the General Duty Clause [Section 5(a)(1) of the Occupational Health Act of 1970] when issuing citations or requesting abatement for automotive lift operations where there is an observed lack of maintenance or training, or when investigating an accident involving the automotive lift, the operator, or the raised vehicle. Authority within the General Duty Clause to reference ANSI/ALI National Standards is vested within the National Technology Transfer and Advancement Act of 1995 that was signed into law on March 7, 1996. OSHA (Occupational Safety and Health Administration) does not perform product compliance evaluations, inspection services for hire, and does not provide product certification. Where do I find an OSHA Certified Lift Inspector? There is no such thing as an OSHA certified lift inspector. Should anyone other than an employee of OSHA present such a claim, realize this is a false and misleading statement. OSHA is not in the business of certifying automotive lift products or automotive lift inspectors. The Automotive Lift Institute offers the only independent, third-party lift inspector certification program meeting the requirements of ANSI/ALI ALOIM-(current edition). How do I get my lifts inspected by an ALI Certified Lift Inspector? My shop has lifts made by several different manufacturers. How do I know that the lift inspector won’t find a lot wrong with the lifts he does not sell? ALI’s Lift Inspector Certification Program addresses standard lift inspection procedures for every style of lift based on the ANSI/ALI ALOIM Standard. ALI Certified Lift Inspectors follow these standard procedures to consistently inspect every lift, regardless of age, origin, manufacturer, etc. All ALI Certified Lift Inspectors sign an Inspector Code of Ethics which precludes them from singling out any particular brand of lift for undue scrutiny. I have some old in-ground lifts, can they be properly inspected? Yes. ALI’s Lift Inspector Certification Program addresses standard lift inspection procedures for every style of lift based on the ANSI/ALI ALOIM Standard. ALI Certified Lift Inspectors follow these standard procedures to consistently inspect every lift, regardless of age, origin, manufacturer, etc. I have some in-ground lifts that have been converted from low pressure to high pressure, can they be properly inspected? I have some imported lifts in my shop, can they be properly inspected? I bought some lifts on the used market, can they be properly inspected? I do not know the manufacturer of the lifts in my shop, can they be properly inspected? The manufacturer of the lifts in my shop is out of business, can my lifts still be properly inspected? Can I protect my company from substandard or “Bait and Switch” services? Demanding an inspection that complies with ALI’s Inspector Certification Program ensures an evaluation has been conducted in accordance with all requirements of the American National Standard ANSI/ALI ALOIM (current edition) and the Manufacturer’s requirements. Demanding placement of ALI’s Annual Inspection Label on each lift successfully passing the annual inspection provides you, your employees and customers, as well as Authorities Having Jurisdiction (such as Insurance Carriers, Building Code Officials, and Health and Safety Officials) with documented independent, third-party assurance the lift is safe to operate. Lift safety is a critical element of employee safety in the lift bay. The increased focus on annual inspection of automotive lifts has brought an increase in unqualified individuals and companies providing substandard lift inspection services. Unfortunately, some instances of “bait and switch” inspection services being provided by inspection companies with at least one ALI Certified Lift Inspector have been reported. The Institute’s Lift Inspector Certification Program does not recognize or support the practice of offering different levels of annual safety inspection based on a combination of price appeal or fewer inspection points than those defined by the manufacturer of the lift or the American National Safety Standard. Complaints of this practice should be provided with direct evidence to ALI for investigation. Beware of other inspection labels intending to mislead or failing to clearly indicate compliance with ANSI/ALI ALOIM (current edition). The requirements allowing placement of ALI’s Annual Inspection Label as representing a demonstration of compliance with ANSI/ALI ALOIM are documented throughout ALI’s Website and the Certification Program Manual. Become familiar with the inspection and operator training requirements found within ANSI/ALI ALOIM – Be an educated buyer of lift inspection services! What should I expect after my lift has been inspected? An ALI Certified Lift Inspector is required to provide a copy of the completed inspection forms including an Administrative Review that summarizes all reportable observations and corrective actions that may be required. 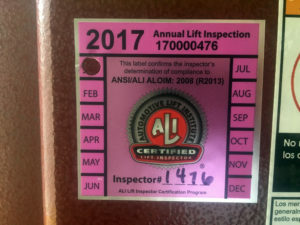 Automotive lifts passing the annual requirements are required to be labeled with the current year’s Annual Lift Inspection Label bearing the ALI’s logo and the inspector’s unique four digit ID number. If you do not receive a copy of the completed inspection or if your lift passes the inspection but a different label than the one presented below is applied, the services provided are outside the scope of ALI’s approved Inspector Certification Program. What about replacement parts – will my lift lose its certified status? ALI’s position is clearly set forth in the governing American National Standard, ANSI/ALI ALOIM, which states at Section 8: “Replace worn, damaged or broken parts with parts approved by the original equipment manufacturer or with parts meeting the original equipment manufacturer specifications.” This identical language also appears in ANSI/ALI ALIS at Section 6.2.6 and ANSI/ALI ALCTV at Section 11.1.6. ALI does not evaluate OEM parts vs. “equal or better” parts. The decision on how to proceed when OEM parts are unavailable due to the lift manufacturer being out of business or for other reasons, any judgments on part quality and the decision on how to bring a lift into compliance is left entirely up to the business entity qualified and willing to make such a judgment: be it the inspection company, the service provider, the manufacturer, or an independent third party. If a lift manufacturer wishes to dictate the source, adequacy, quality, or effectivity of replacement parts, that is a matter between the lift manufacturer and those wishing to provide substitute parts. ALI provides information to candidate lift inspectors in an attempt to equip them with the knowledge, skill, ability, and experience to inspect installed automotive lifts. Service providers may decide to make parts evaluations or decline to make parts evaluations: this decision is left to the service provider. There is no practical way for a manufacturer or the Certification Body to supervise substitute part conformity and/or the withdrawal of certification in the field. If there is a product failure due to the use of non-OEM parts, then the burden will fall to whoever substituted the non-OEM parts on the certified lift to demonstrate that the parts met the specifications required.